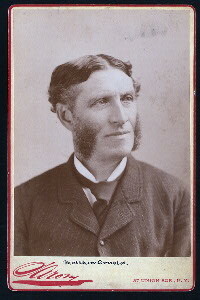 Matthew Arnold delivered several speeches on Emerson. According to an 1883 article in The New York Times, "Mr. Arnold, while professing profound veneration and love for Emerson, declared that he was not a great poet, nor a great man of letters, nor a philosophy-maker--facts which, he said, no one new better than Emerson himself. Emerson's essays, however, were, in Mr. Arnold's opinion, the most fruitful prose writings of the age." His comments, representative of many of the American vs. English battles in the art world of the tiem, spurred many responses in the Times by Joel Benton and others. Read more about Matthew Arnold here. Click here to read a review of one of Arnold's speeches in The New York Times. Emerson. Mr. Benton's Recent Article--Matthew Arnold's View--Carlyle. Click here to read a rebuttal to Arnold's views on Emerson.